There are several variants of Shogi, Japanese chess, that are played on boards of different sizes. This is the smallest known of them. It was invented (or rediscovered?) around 1970 by Shigenobu Kusumoto of Osaka. Wayne Schmittberger has said (according to Philip Cohen in the July/August 1995 number of NOST's periodical NOSTALGIA) that a Minishogi Association has existed (and may still exist?) in Osaka. Each player has one king, one golden general, one silver general, one bishop, one rook, and one pawn. As in Shogi, pieces are flat pieces of wood (or ivory or plastic), with the symbol denoting the piece displayed on top of it. It has a pointed shape with five sides (see the figures below). We can see from the direction of the point which player owns the piece, i.e., pieces point in the direction of the opponent. King a1; Gold General b1; Silver General c1; Bishop d1; Rook e1; Pawn a2. King e5; Gold General d5; Silver General c5; Bishop b5; Rook a5; Pawn e4. The King (actually: jewelled general) moves as a king in orthodox chess. The Gold General moves one square in one of the following directions: vertically, horizontally, or diagonally forward, i.e., in all directions except diagonally backwards. The Silver General moves one square in one of the following directions: diagonally, or straight forward, i.e., not horizontally and not straight backwards. The Bishop (actually: angle-going) moves as a bishop in the orthodox chess game. The Rook (actually: flying chariot) moves as a rook in the orthodox chess game. The Pawn (actually: soldier) moves one square straight forward. They capture in the same way as they move. Most pieces can promote, except the king and the gold general. The symbol of the promoted piece is displayed at the bottom of the piece (often in red, while unpromoted pieces are shown in black). A piece can promote, when it has made a move (with or without capture) where either the position before the move, the position after the move, or both was/were on the last row of the board at the opponents side. Usually, promotion is not compulsory: one may choose to promote or not to promote a piece. However, a pawn on the last row must be promoted (as it cannot move any further). The Silver General promotes to a golden general. Here you see the symbol displaying a promoted silver general. The Pawn promotes to a golden general. Here you see the symbol displaying a promoted pawn. The Rook promotes to Dragon King. Here you see the symbol displaying a Dragon King. The dragon king moves as a rook, but may also move one square diagonally, i.e., it has the combined moves of king and rook. The Bishop promotes to Dragon Horse. Here you see the symbol displaying a Dragon Horse. The dragon horse moves as a bishop, but may also move one square horizontally or vertically, i.e., it has the combined moves of king and bishop. Pieces that are taken from the opponent may be reintroduced on the board as pieces of the player that took the piece. For instance, if player A has taken a pawn from player B, player A has the possibility to put this pawn on the board as one of his own pieces in any later move. When a player takes a promoted piece, the piece converts to its original status. For instance, when a player takes a dragon king, he can drop a rook. Dropping a piece is instead of a normal move. Certain restrictions apply: a piece must always be dropped on an empty square. A pawn cannot be dropped on a column where the player has already another unpromoted pawn, and may not be dropped to give checkmate. (A pawn may be dropped to give check, and any other piece can be dropped to give checkmate.) Pieces may not be dropped on squares from which they cannot move, e.g., a pawn may not be dropped on the last row. Pieces can be dropped to squares that this type of piece couldn't reach from its opening setup, e.g., one may drop a pawn on c3. Object of the game is to take the king from the opponent. Giving perpetual check is forbidden. Some rules concerning repetitions of positions are omitted here. Usually, one decides in the following manner who makes the first move: a player tosses a pawn; the other guesses whether the pawn-side or the golden-general-side comes on top, and moves first when his guess was right. 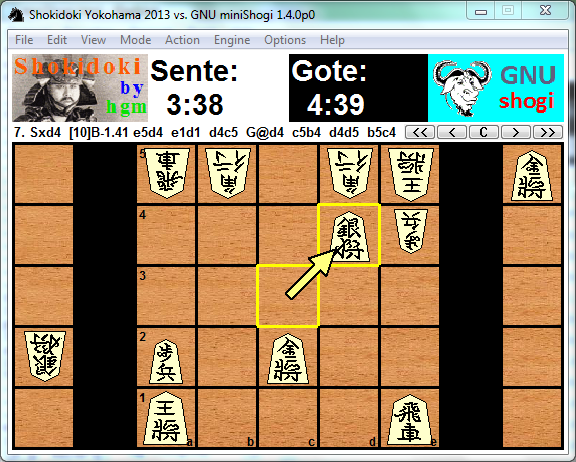 The picture below is an animated minishogi game, played by Köksal Karakus against a computer program. Written by Hans Bodlaender. Thanks to Katsutoshi Seki for a correction on the name of the inventor.